The term "ground nut" is another name for the common peanut, which grows inside a protective shell below the surface of the ground. Typically served roasted, ground nuts are used as both a snack food and ingredient in other food dishes. While ground nuts are a good source of calories from fats and proteins, they are often served salted for taste, making them high in dietary sodium. Ground Nuts has 375 Calories and 12.50 g of Protein per 100 gram serving according to the nutrition facts provided by the USDA Food Composition Database. According to data from the U.S. Department of Agriculture (USDA), a single 1/4-cup serving of shelled ground nuts, or peanuts, including halves and whole nuts, yields around 36.5 grams of edible nuts, with around 19 grams of fat and 10 grams of proteins. The same serving contains just over 5 grams of carbohydrates, 3.5 grams of dietary fiber and 0.5 gram of water, with the remaining portion consisting of other nutrients. The USDA also points out that 1/4-cup of ground nuts contains around 230 calories, or just over 11 percent of the recommended daily intake of calories. This percentage is based on a typical 2000 calorie per day diet for the average adult. Fats contribute the most, at about 170 calories per serving. Proteins are next at 40 calories, and carbohydrates deliver 20 calories in the serving. Ground nuts also contain several essential vitamins, including significant amounts of niacin at 5 milligrams or just over 33 percent of the recommended daily intake (RDI), and riboflavin at 0.3 milligrams or around 23 percent of the RDI. Vitamin B6, folate and thiamin are also available in smaller quantities. 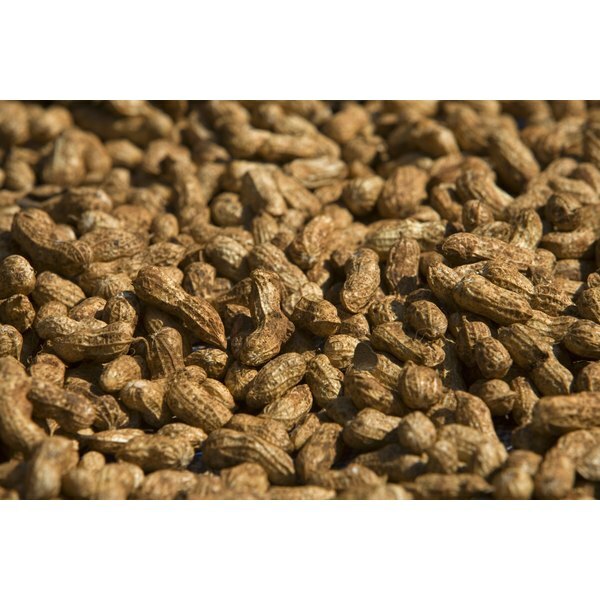 Several important dietary minerals can come from ground nuts. The highest amount is phosphorus at 145 milligrams, or just over 20 percent of the RDI. Magnesium is also high in ground nuts, at 64 milligrams or just over 17 percent. Other smaller quantities of dietary minerals include calcium, iron, selenium and zinc. Ground nuts are often served salted, making them high in sodium. Added sodium in the diet can raise blood pressure and increase the risk of both heart disease and stroke, according to the American Heart Association. The USDA states a 1/4-cup serving of salted ground nuts contains around 115 milligrams or just under 10 percent of the total recommended intake of sodium per day. Individuals following a low-sodium diet may choose to eat unsalted ground nuts.